The anthology makes use of a range of classic translations, and includes new translations by Jane Chamberlain and Jonathan RUe, explanatory introductions, an index and a glossary. Jane Chamberlain is Lecturer in Philosophy at Morley College. She is editor of Kierkegaard's Johannes Climacus (2001). Jonathan Rée is Lecturer in Philosophy at Middlesex University. His books include I See a Voice (1999) and Philosophical Tales (1987) and he is co-editor, with Jane Chamberlain of Kierkegaard: A Critical Reader (Blackwell 1997). 2. The Concept of Irony (1841):. 4. Fear and Trembling (1843):. A Report by Constantin Constantius. Is the Past More Necessary Than the Future? Or: Does the Possible Become More Necessary by Becoming Actual?. ?4. The Apprehension of the Past. 7. The Concept of Anxiety (1844):. Anxiety as the Consequence of That Sin Which is Absence of the Consciousness of Sin. 9. Concluding Unscientific Postscript (1846):. Possible and Actual Theses by Lessing. Towards an Understanding with My Reader. A First and Last Explanation. 10. My Work as an Author (1850, 1859):. A: The Ambiguity or Duplicity in the Whole Authorship. Part Two: The Whole Work of Authorship. Chapter Two: The difference in My Personal Mode of Existence. A: In Relation to the Aesthetic Works. B: In Relation to the Religious Works. Chapter Three: The Share Divine Governance Had in My Authorship. 11. Johannes Climacus, or De Omnibus Dubitandum Est (1842, 1869):. Part One, In which Johannes Begins to Philosophise with the Help of Traditional Ideas. Chapter One: Modern Philosophy Begins with Doubt. ?1 How Should the Third Thesis be Understood Literally. ?2 How Did it Come to Pass that Modern Philosophy Began with Doubt?. (a) Was it by Accident That Modern Philosophy Began with Doubt?. (b) Was it by Necessity that Modern Philosophy Began with Doubt?. Chapter Two: Philosophy Begins with Doubt. ?1. Is the First Thesis Identical with Thesis Three?. ?2. How Does the Individual Relate to the First Thesis?. (a) How Does an Individual who Affirms the First Thesis Relate to It?. (b) How Does the Individual to Whom the First Thesis is Proposed Relate to the Individual who Propounds It?. Chapter Three: In Order to Philosophise One Must Have Doubted. Part Two, In Which Johannes Tries to Think Propriis Auspiciis (On His Own Account) De Omnibus Dubitandum Est. Chapter One: What Is It To Doubt?. ?1. How Must Existence be Constituted in Order for Doubt to be Possible?. Kierkegaard's Works and their Authors. 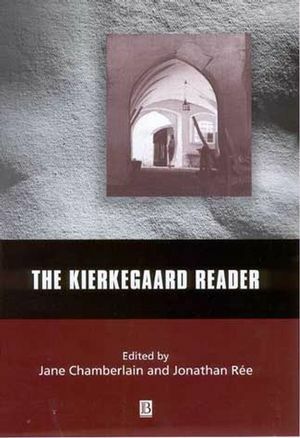 The only reader to present a full range of Kierkegaard's philosophical work. Includes new translations and explanatory introductions, by Jane Chamberlain and Jonathan RUe. Reflects the latest approaches to Kierkegaard interpretation. Portrays Kierkegaard as one of the greatest philosophers in the western tradition, and as a literary stylist, a master of tone, wit and humor.